How do you announce a pregnancy? With an adorable song and dance, of course! We’ve seen all sots of pregnancy announcements on Babyology. But this upbeat song and dance act, from two couples so adorable we just want to scoop them up in a big group hug, is our favourite yet. Meet Jon and Danielle Murray. They are the new kids on the YouTube block and parents to three “small but spirited girls”. They knew what was coming when they became pregnant again: “Was it planned?”; “Guess there wasn’t much on TV last month, hey?”; “You do know how it happens right?”; “You guys are nuts”. So they hit the negative comments head-on with a video announcement so delightful, so full of baby joy, that even the world’s biggest baby-phobic grump would be hard-pressed not to watch it with a smile and wish them the best of luck at the end. See for yourself. Sung to the tune of Walk the Moon’s catchy hit Shut up and Dance, the Murrays team up with Jon’s brother Aaron and his wife Liz, who are also expecting another little one. And to add to the excitement, both babies are due within two weeks of each other! We love everything about this zippy video, including how Jon and Danielle cut straight to the chase and sing the answers to the questions they know everyone is going to ask. No, they are not finding out the baby’s gender. Yes, life is crazy so what’s adding one more? Yes they are fully aware how babies are made. But, as they explain, “We just like kids”. A pregnancy is always an exciting event, first time or fourth time around. 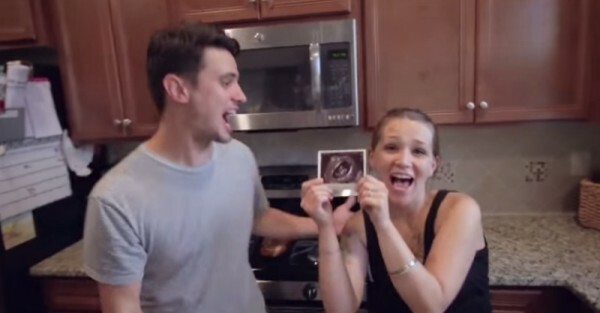 The young couple clearly love their growing family and are not afraid to get a little silly with their exciting news. A big Babyology congratulations from us to all the Murrays. Check out some more creative pregnancy announcements from our archives, including this catchy Oops I Did It Again parody.